The Roman walls that surround the heart of Barcelona embrace Bàrcino, which existed from the 1st century BC to the start of the Middle Ages. A city that began as a small colony and gradually grew to briefly become an imperial city. The area stretching between the Besòs and Llobregat river deltas, the site of today's Barcelona, was already populated in prehistoric times. Shortly before the start of the current era, it housed various settlements of native peoples, mainly Laietani. According to legend there was also a Jewish colony at the top of Montjuïc, which might explain where its name ("Jewish Mountain") comes from. When the Romans arrived, between 15 and 13 BC, they were looking for the best place to found a colony between the prosperous Emporiae (Empúries), on the coast to the north, and Tàrraco (Tarragona), to the south. The spot they chose was the top of Mount Taber, a small hill facing the sea and looking over the plain, where Plaça de Sant Jaume is today. They had little difficulty in gaining control over the neighbouring settlements. The colony, called Julia Augusta Faventia Paterna Barcino, grew rapidly. A wall was built around it between the 1st and 2nd centuries, which was reinforced between the 3rd and 4th centuries and marked the perimeter that remained the same until the Middle Ages. It also kept the structure of a Roman city, with a forum at the centre from which two streets spread out in the form of a cross, the cardus and the decumanus, leading to the four entrance gates. 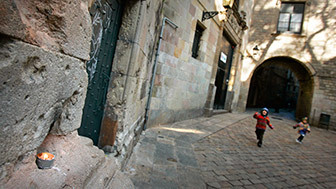 It is still possible to trace this structure today: Carrer Llibreteria, which starts in Plaça de l’Àngel where the Porta Sinistra, one of the gates in the wall, used to be, is the old cardus that crossed the city from north to south to the Porta Dextra, at the end of today's Carrer del Call; Plaça Sant Jaume, in the centre, extends a little to the south-east of where the Forum was in those days; and three modern streets, Bisbe, Ciutat and Regomir, follow the route of the old decumanus from the Porta Praetoria in the west to the Porta Decumana or Porta del Mar, in the east. The presence of large domus in the city, houses with gardens and rich ornamental decoration, is proof of the presence of important property-owning families. And it was probably thanks to these families that the small Bàrcino gradually grew in size and significance. By the start of the 5th century money was already being minted in the city, establishing the first link with the imperial elite and placing it among the powerful cities. In fact, it was particularly in the 5th century, at the end of the Roman Empire, that the city became more important. Between 410 and 415, the Visigothic king Ataulf installed his wife Gala Placidia here, turning Bàrcino into an imperial seat for a brief period, until Ataulf was assassinated in the city and the court moved to Aquitania in Gaul, present-day Aquitaine, France. Despite this, Bàrcino's close relationship with the Visigothic kings continued until the 8th century. Numerous remains from the city's Roman period have come to light over the last 80 years. So the Barcelona City Council Archaeology Service has launched the Bàrcino Plan, with the idea of reclaiming archaeology for the public through a series of initiatives, notably the Barcelona Archaeological Map , with 3,000 archaeological sites in the city. Hidden away in the courtyard of a Gothic palace on Carrer Paradís are four 12-metre-high columns from the temple that the Romans built in honour of Emperor Augustus at the top of Mount Taber. 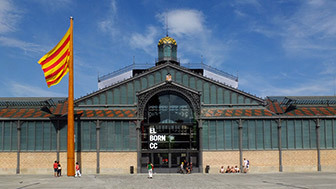 The Museu d’Història de Barcelona (MUHBA - Barcelona History Museum) is housed in one of the most important monumental complexes in the city. It is built over Bàrcino's remains and visitors can stroll through Roman streets and the interior of some of the buildings in the subsoil. The remains of the harbour baths, which were outside the walls, can be found in the Pati Llimona Civic Centre, along with part of the Porta de Mar, the access gate to one end of the decumanus. Outside the old walled Bàrcino, in today's Plaça Vila de Madrid, lie the remains of the Roman Funeral Way, a necropolis dating from the 1st to the 3rd century. Items found at this site are displayed in the Interpretation Centre. The remains of a large house, or domus, discovered on Carrer Sant Honorat, near Plaça Sant Jaume, which includes commercial premises dating from the 4th century, allow us to learn more about the domestic architecture of the Roman period. If you want to see remains showing how Barcelona and Catalonia have evolved since prehistoric times, a visit to the Archaeological Museum of Catalonia (MAC) on Montjuïc is a must. They house items from the Iberian, Roman and Visigothic periods. 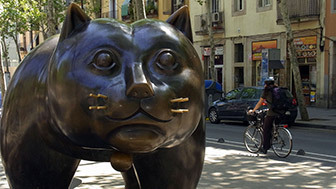 As part of the Bàrcino Plan, the Barcelona City Council Archaeology Service has created a list of all the places where excavations are being carried out, which is available to the public. Before setting off around the Roman city, you can take a look at the Barcelona Archaeological Map to find out exactly where the Bàrcino wall ran.